PigPen held it’s first show in 9 months at the end of February in memory of it’s co-founder Gabriel Hardisty-Miller who passed away last year. It was held at the spiritual home of PigPen- The Macbeth, Hoxton. If you’ve been to The Macbeth and you’ve been to PigPen, you’ll know why. Gabriel was the brilliant taste-maker and curator behind PigPen. He was a non-verbal young man with autism. During the four years of PigPen he chose a plethora of electric and excellent acts using his yes/no comm device. He was a tireless campaigner with the National Autistic Society, a role model for raising awareness and encouraging people to think differently about disability. It was only fitting that all profits form the PigPen Memorial Show went to the NAS. The proceedings kicked off with a poignant procession from Gabriel’s estate down the road to the Macbeth. The procession was part of the Dron Festival at Hundred Years Gallery, Gabriel’s famous PigPen throne (that he always sat on during the shows) was decorated with garlands of flowers and lights and processed with bell ringing family and friends. From here the marathon of performances began. The first half of the show saw PP stalwarts Eddie Halliday, Robyn Steward, Bram Arnold, Captain Spoon and Charlotte Young take to the stage for acoustic and performance art sessions. Then followed a beautiful tribute to Gabriel by jazz singer Sarah Niles with Rob Grundel on keys. For anyone that remembers the Roy Davies Jr, Peven Everett dance floor classic- ‘Gabriel’, Sarah did the most moving version of this. As ever, DJ’s Brian Turner (AKA Bram Arnold) and Good Grief kept the crowd bubbling in between acts with a trademark blend of soul, indie pop and odd music from their varied record collection. 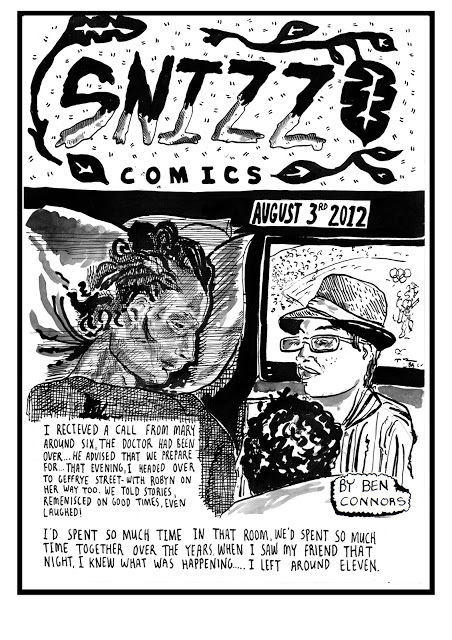 The vegan chilli ran out within the first couple of hours and there was the latest edition of ‘Snizz Comics’ by myself. Christine Binnie (with help from Tom Madders of the NAS) ran the PigePen Art Raffle with gusto. With such a fantastic array of prizes it’s not surprising this alone raised £250. We had artworks by Robyn Steward, Lewis Heriz, Martin Kingdom and myself, Dean Atta’s debut poetry collection plus a £150 meal voucher at a fancy restaurant up for grabs. Needless to say, all prizes went to very happy winners! The first half of the show ended with one of South London’s finest voices and began with the same- Mr Joel Culpepper (one to watch people), following him PigPen legend with a capital L- Tim Ten Yen, poet extraordinaire Dean Atta and despite motor troubles- Honkeyfinger with their trippy, sweltering blend of psych -swamp rock. How could we possibly fit in anymore you say? Well we did. United Vibrations opened their set with their beautiful and moving piece ‘Don’t Be Sad’ and continued to uplift us all in a way only UV could. Finally DJ/Producer Noel Eeteks (who grew up in the house next door to Gabriel) took the helm on the ones and twos and saw PigPen well into the night. Not only was this a very special night that managed to raise £520.60 in Gabriel’s name, it was also a show that saw Gabriel very much present. The acts he chose and nights he curated were an extension of his unique personality, it felt as though the PigPen Memorial Show was as close as we could get to having him with us again. It was a blast from an entertainment point of view, also spiritual to feel his presence again. A huge thanks to all involved- far too many to mention. On a final note, many people have been asking me on the future of PigPen and Snizz comics, all I can say for now is watch this space….